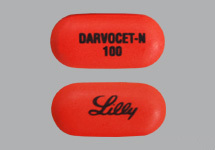 Darvocet is a brand name for mild narcotic analgesic drug which combines Acetaminophen and Propoxy or Propoxyphene, prescribed for the relief of mild to moderate pain, with or without fever. It is sold as: Darvocet A500, Darvocet N 100, Darvocet N 50, Propacet 100, Wygesic, Darvon-N (propoxyphene napsylate), Darvon (propoxyphene hydrochloride), Darvon Compound-65 (propoxyphene hydrochloride, aspirin, and caffeine). Darvocet is in a class of drugs called narcotic analgesics. Darvocet works by changing the way the body feels pain. Acetaminophen is a less potent pain reliever that increases the effects of Propoxyphene. Together, acetaminophen and Propoxyphene are used to relieve pain. What should I discuss with my healthcare provider before taking Darvocet? Do not take Darvocet if you suffer from depression or have suicidal thoughts. You may not be able to take Darvocet, or you may require a dosage adjustment or special monitoring during treatment if you have any of the conditions listed above. Darvocet may cause addiction and withdrawal symptoms as well as other harmful effects in an unborn baby. Do not take Darvocet without first talking to your doctor if you are pregnant or could become pregnant during treatment. Darvocet may cause addiction and withdrawal symptoms in a nursing baby. Do not take Darvocet without first talking to your doctor if you are breast-feeding a baby. If you are younger than 18 years of age or older than 60 years of age, you may be more likely to experience side effects from Darvocet therapy. Your doctor may prescribe a lower dose. What happens if I overdose on Darvocet? Symptoms of a Darvocet overdose include slow breathing, seizures, dizziness, weakness, loss of consciousness, coma, confusion, tiredness, cold and clammy skin, small pupils, nausea, vomiting, and sweating. What should I avoid while taking Darvocet? Avoid alcohol while taking Darvocet. Alcohol can increase drowsiness and dizziness caused by the medication which could be dangerous. Also, alcohol may increase the risk of liver problems when taking acetaminophen. Use caution when driving, operating machinery, or performing other hazardous activities. Darvocet may cause drowsiness. If you experience drowsiness, avoid these activities. Do not take other over-the-counter and prescription products that contain acetaminophen. Too much acetaminophen could be dangerous. Talk to your doctor or pharmacist before taking any over-the-counter preparations. Drowsiness or dizziness caused by Darvocet may be increased by other drugs such as antidepressants, alcohol, antihistamines, sedatives (used to treat insomnia), other pain relievers, anxiety medicines, and muscle relaxants. Together, these medicines may cause dangerous sedation, possibly resulting in unconsciousness or death. Tell your doctor about all medicines that you are taking, and do not take any medicine without first talking to your doctor. What are the possible side effects of Darvocet? Darvocet may be habit forming. Physical and/or psychological dependence can occur, and withdrawal effects are possible if the medication is stopped suddenly after prolonged or high-dose treatment. Do not stop taking Darvocet suddenly without first talking to your doctor if you have been taking it continuously for more than 5 to 7 days. Your doctor may want to gradually reduce the dose.